Oohh! This counting by 2’s to 50 page has a few numbers filled in, one in each row. It’s a confidence booster! Have your kids can fill in the rest. 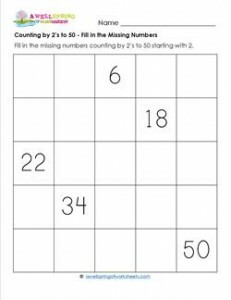 Please go to this page to see all the counting by 2’s to 50 worksheets in this set.